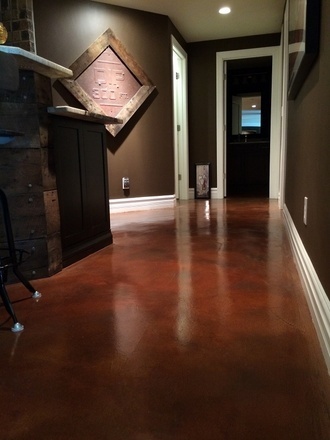 One of the most popular trends in restoring concretes nowadays is Stained Concrete. 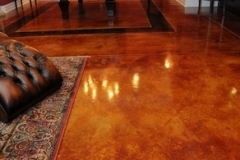 Stains do more than just add color to a slab. 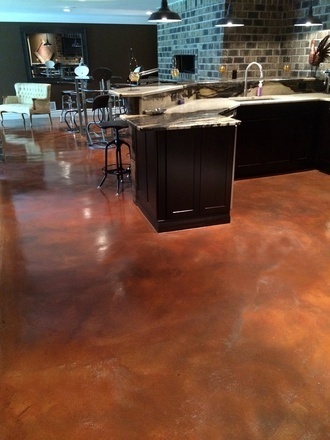 Unlike paint that produces an opaque or thick color, stains infuse the appearance of concrete with rich and deep hues. 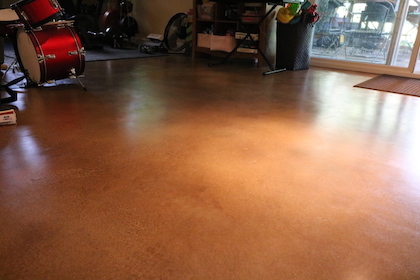 The results are so amazing, it’s hard to tell that it is just a stain coating on a slab. 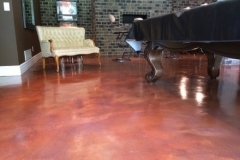 Of all the options for colored concrete, stained concrete driveways, pool decks, interior floors or patios are the most recommended option. It penetrates past the surface, establishing solid adherence and optimum results. It is resistant to temperature, making it ideal for use on both indoor and outdoor surfaces. It can be used on new and resurfaced slabs, as soon as the surface has already cured for a month. Stains come in two kinds: Acid and Water-based. Acid stains – These are reactive stains that consist of inorganic metallic salts. This stain penetrates deep into the surface of the slab. It creates a chemical reaction once it comes in contact with the lime and mineral content that are randomly dispersed in the concrete. The results are often antiquated or variegated, giving the surface a luxurious look at a more economical cost. The cool thing about acid staining is that each slab it is applied to will color differently and uniquely. 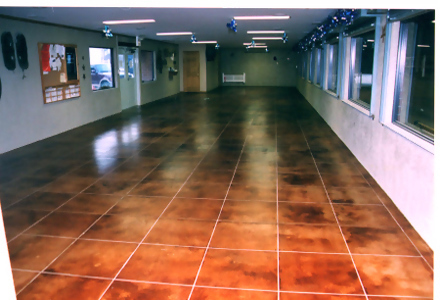 Water-based stains – These are non-reactive stains that create a colored film on the surface of the concrete. The results are often translucent to almost opaque. Because it does not involve chemical reactions, the color is more consistent, making it ideal for specific designs and patterns. Depending on which stain type you choose, the available colors will vary. 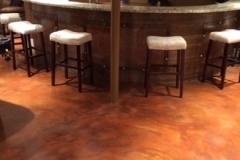 Acid stains come in subtle earth tones like brown, blue-green, tan, terra cotta, and more. Water-based stains, on the other hand, come in dozens of standard colors, black, white, and metallics. You can mix two or more colors to create more interesting hues. The stains are permanent, so even if the slab gets chipped or scratched, the colors will always be present. 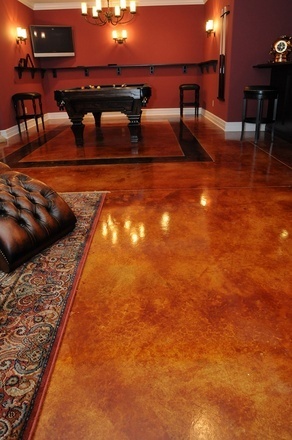 Sealing the stained surface is also highly recommended to keep the colors looking deep, intense, and polished. Blending two or more colors can produce uniquely interesting hues. You can create patterns and decorative effects with the use of stencils. After staining, add texture and design on the slab by engraving or scoring patterns on the surface. 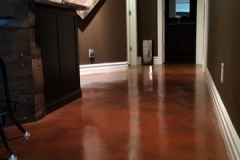 What is the Cost of Staining Concrete? 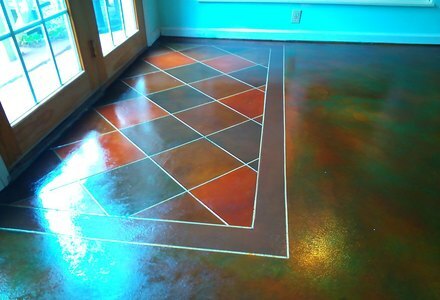 For each square foot of concrete space, the range of having it stained is between $2 to $4. However, many factors can greatly influence the total costs. Such factors include the project size, how much surface preparation is needed, if repairs will be required, and if additional customization will be done. 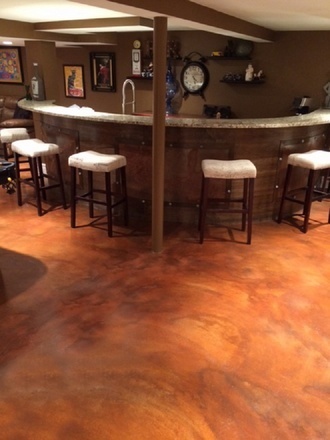 Acquire uniquely appealing concrete with Stained Concrete. 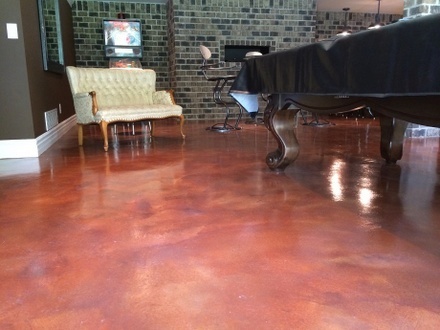 Want a permanent enhancement to your properties? 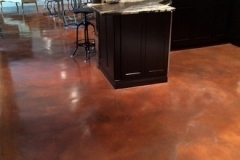 Dallas Decorative Concrete offers stained concrete solutions. 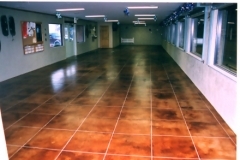 Our highly trained team has over 20 years of experience in handling surface preparation, stain application, and concrete sealing. 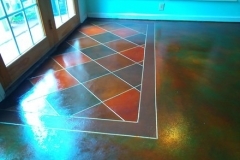 We service both residential and commercial surfaces, be it indoors or out. Call or email us today for a free consultation and price quote. Need some pool deck, driveway or concrete patio ideas? We’d love to hear from you!